A personalized Wedding magazine cover is a unique gift to celebrate and commemorate this happy occasion. Upload a photo of the couple then personalize each headline to be all about their love, family, future plans and the wedding. The search for unique wedding gift ideas is over… simply personalize a YourCover wedding magazine cover to give a personalized wedding gift that’s unique as the special couple starring on the front cover. The wedding magazine cover template is customized with the couple’s photo as well as headlines all about their wedding, their family, and future life together. 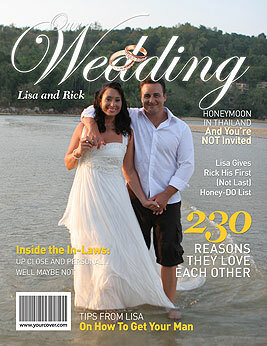 Upload your photo to the magazine cover generator then customize the headlines to reflect the couple being celebrated. Revise the default headlines, add your own or use some from our library of suggestions – you will be making this personalized wedding gift as unique as the recipients starring on the front! Grooms – a personalized magazine cover is a unique and romantic groom to bride gift idea. Show her how much you love her by choosing to make a magazine cover all about the two of you! She’ll love it because you made it just for her. Our one-of-a-kind back cover feature is available just in case you have a more photos and info than can fit on the front. Purchasing options provide you with a variety of choices so you can choose the fake magazine cover product that is most convenient for you – a photo file download for instant printing at home or a photo print that YourCover will produce and ship to you. Frames, gift service, rush and international shipping are also available. A wonderful memento to commemorate a milestone occasion, a YourCover personalized magazine cover is a unique wedding gift that they’ll keep forever! Get started on your Magazine Cover today.